Sun Street Bread had buttermilk biscuits at the farmers market on Sunday, so we decided to pick some up and make biscuits and gravy for dinner. Yes, yes, I can make my own biscuits, but with such fantastic ones easily on hand there is no need to. Ok, there is really no pretty way to photograph this dish, believe me I tried, but what it lacks in looks it totally makes up for in taste. Sausage gravy is really pretty basic, sausage, milk, flour and lots of pepper. Matt thought we should add one more ingredient to give it an extra kick, instant espresso. Coffee is the secret ingredient in my grandmother's recipe for Swedish meatball gravy, so it made perfect sense to me. What you end up with is a dark rich gravy with a hint of coffee flavor. I loved it. Matt thought there was a little bitterness from the espresso, but I didn't notice it at all. Do not skimp on the pepper in this gravy! In a large skillet, sauté the sausage over medium heat until cooked through. If your sausage is lean and doesn't release much fat add about 1/2 T olive oil. Sprinkle with the flour. Stir while cooking for 1 minute. Mix the espresso into the milk. Stir slowly into the sausage. Cook while stirring until thick and creamy. If it is too thick stir in a little more milk. Stir in the pepper. Taste and add salt as needed. Cut biscuits in half and top with sausage and gravy. yes please! i've had coffee gravy and loved it. Whoa, there!!!! Who uses ITALIAN sausage in sausage gravy? It might be quite good, but good ol' Southern sausage is definitely the go-to sausage for this app. Unfortunately, this northern area is indeed breakfast-sausage-challenged. I have to make my own!!!!!! P.S. I will try espresso powder in my next batch of gravy! Anonymous - Someone who has half a pound of Italian sausage in the fridge to use up. 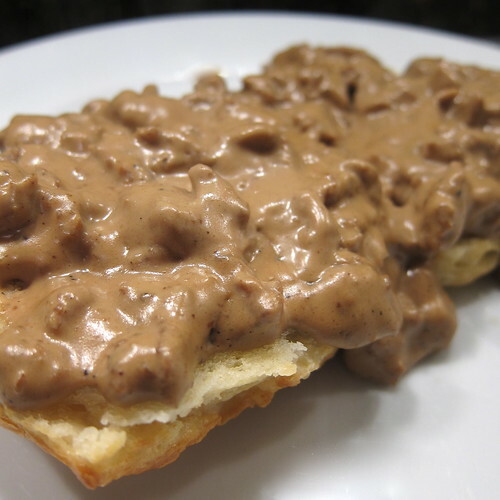 meh, sausage gravy is sausage gravy, as far as this southern gal is concerned. nice plate of food, kat! My husband was just hinting at biscuits and gravy the other day. I'm definitely tossing in some coffee next time. I use Italian sausage as a substitute for breakfast sausage a lot and vice versa. All turns out great to me.